(TORONTO - September 30, 2009) The Art Gallery of Ontario has acquired a major new installation by Winnipeg based artist Sarah Anne Johnson, supported by a generous donation from art collector Michael F. B. Nesbitt. House on Fire explores the story of Johnson’s maternal grandmother’s unwitting participation in CIA-funded brainwashing experiments at the Allan Memorial Institute at McGill University in the mid-1950s. As in her previous work, The Galapagos Project (2007) and Tree Planting (2005), Johnson works in series, switching between media to comprehensively explore her subject matter. 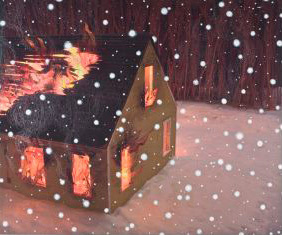 House on Fire consists of 13 works on paper (paintings and drawings on photographs and newsprint); 9 bronze sculptures; and a major sculpture in the form of a surreal dollhouse, from which the series takes its title. The AGO is acquiring all of the works listed above. Sarah Anne Johnson was born in Winnipeg in 1976. She completed a BFA at the University of Manitoba and an MFA at the Yale School of Art. In 2005, her exhibition Tree Planting, comprising more than 60 images, was acquired by the Guggenheim Museum. In 2008, Johnson was the inaugural winner of The Grange Prize, a photography prize co-sponsored by Aeroplan and the AGO. The prize includes a $50,000 cash prize and a solo exhibition at the AGO, for which House on Fire was created. In addition to the aforementioned museums, Johnson’s work is also part of the collections of the Spencer Museum of Art, Lawrence, Kansas; Yale University Art Gallery; and the National Gallery of Canada. Johnson lives and works in Winnipeg. With a permanent collection of more than 79,000 works of art, the Art Gallery of Ontario is among the most distinguished art museums in North America. In 2008, with a stunning new design by world-renowned architect Frank Gehry, the AGO opened its doors to the public amid international acclaim. Highlights include Galleria Italia, a gleaming showcase made of wood and glass running the length of an entire city block along the Gallery’s façade; and the feature staircase, spiralling up through the roof of Walker Court and into the new contemporary galleries above. From the extensive Group of Seven collection to the dramatic new African art gallery; from David Altmejd's monumental installation The Index to Peter Paul Rubens' masterpiece The Massacre of The Innocents, a highlight of the celebrated Thomson Collection, there is truly something for everyone at the AGO. The Art Gallery of Ontario is funded in part by the Ontario Ministry of Culture. Additional operating support is received from the Volunteers of the AGO, the City of Toronto, the Department of Canadian Heritage and the Canada Council for the Arts. May 26, 2009. With over 20,000 votes in a nine-week span, the Art Gallery of Ontario (AGO) and Aeroplan are pleased to announce that Marco Antonio Cruz is the winner of the $50,000 Grange Prize for 2009. December 22, 2009. Public response to the Canadian exclusive of King Tut: The Golden King and the Great Pharaohs continues to be overwhelmingly positive, with more than 100,000 tickets sold since they became available just under three months ago. November 24, 2009. The wait is over. More than 30 years after the Art Gallery of Ontario first brought the treasures of the Egyptian boy king to Toronto, a new exhibition—King Tut: The Golden King and the Great Pharaohs—opens to the public at 10 am today and continues through April 18, 2010. Sept. 29, 2009. Updates projected on Gallery’s outer walls; Steichen exhibition open until 3:00 am. September 21, 2009. A 26-foot statue of Anubis - the ancient Egyptian god of the underworld - has arrived at the Art Gallery of Ontario to mark the launch of public ticket sales for the AGO's upcoming exhibition KING TUT: The Golden King and the Great Pharaohs. August 31, 2009. Last chance to pre-register for Tut tickets fast approaching; AGO members can purchase this week. March 27, 2009. Prepare for rebellion at Massive Party, the Art Gallery of Ontario’s first on-site benefit since its grand reopening.